Sit back and enjoy the view with The Garden Rocker. These beautiful and unique outdoor rocking chair.. Sit back and enjoy the view with The Garden Rocker 2 Piece Set. These beautiful and unique outdoor r.. The Portside 3-Piece Bistro Set is an attractive and comfortable outdoor table and chair set. Great .. Sit back and enjoy the view with The Garden Rocker 3-Piece Set. These beautiful and unique outdoor r.. The Portside Plantation Rocking Chair is the perfect rocker for a porch or indoor area. The Plantati.. The Portside 6-Piece Seating Set is an attractive and comfortable outdoor seating group. All-weather.. Outdoor Seating to provide Comfort and Style on the Patio or Porch! Outdoor Furniture and Garden offers a variety of seating choices that will make a statement in your yard, on the porch or on the patio. Not only will any choice provide a comfortable place for friends, family or guests to relax, any piece will add style, color and elegance to the space. Whether you’re looking for a small conversation area on the patio or a comfortable rocker set for the front porch, we’ve got you covered. We offer a selection of durable, quality built sets that will enhance your outdoor living space for years to come. The Portside Bistro Set is ideal for a smaller area or as an addition to your existing outdoor pieces. The all-weather wicker and outdoor fabric cushions make this set not only versatile, but also a beautiful and comfortable addition to your outdoor living spaces. Our Westport Settee will be a stately resting spot in the garden or a focal point of the front porch. Available in a variety of colors and finish options, you can chose to mix or match with existing pieces. Outdoor Furniture and Garden also offers complete seating options such as the Lexington 6-Piece Sofa Set. 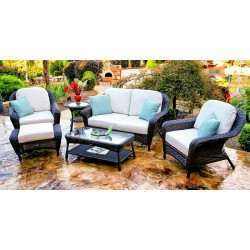 This stunning set is perfect for an outdoor living room or covered porch. It provides seating pace for the whole family and is available in a variety of wicker color choices, along with fabric choices. Add the Lexington 3-pc Bar set for a great addition to the lanai or even a small deck. Classic and versatile, the tall table and chairs add a decorative appeal to any space. If you’re just looking to add a splash of updated color to your existing pieces, we also offer outdoor pillows and cushions that can give you the pop of summertime color wherever you may need it.